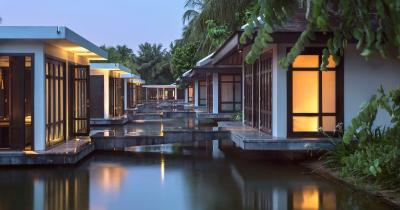 Lock in a great price for Four Seasons The Nam Hai, Hoi An, Vietnam – rated 9.2 by recent guests! 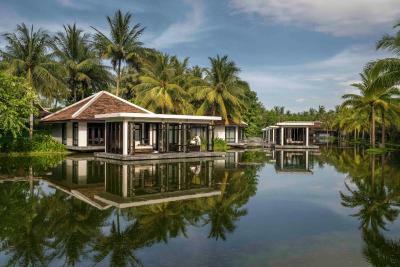 The overall concept is excellent with villas so close to the beach. The design is beautiful with a local twist. Overall, it is easy to get to, no hassle. Airport pick up is good. Most of the hotel staff are nice , friendly, and well trained. Nice beach with good privacy. 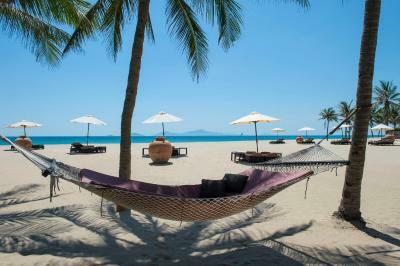 Excellent hotel with usual 4 Seasons standards at reasonable prices. Great service from the staff. Breakfasts were served to the table rather than buffet collection. Picturesque place, quite and well maintained property. 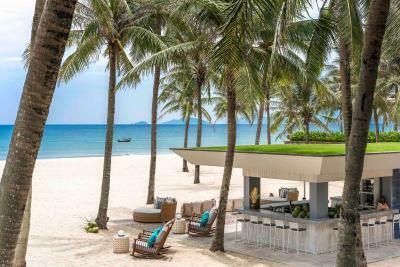 Most staffs are professional, food was nice, pool area was fastastic - peaceful atmosphere was the very place to turn off everything in the brain, and keep calm in oneself. Definitely, want to stay here again. 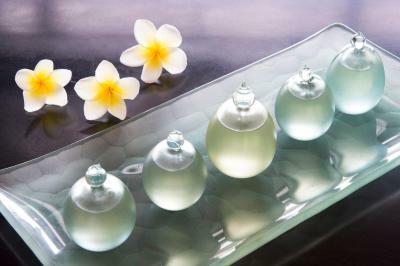 Very good amenities and services. Staff were very polite and helpful. 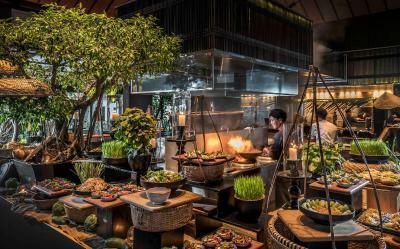 Food quality was excellent, although a little pricier than outside the resort. I was travelling with a small group of friends and it was the perfect choice. 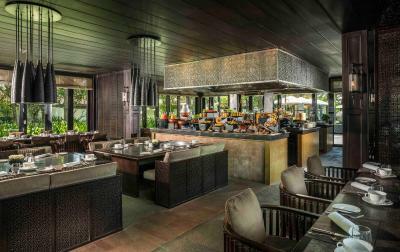 The property, especially the swimming pools, is simply amazing; the food is exceptionally good and the staff very friendly. Very good gym as well. 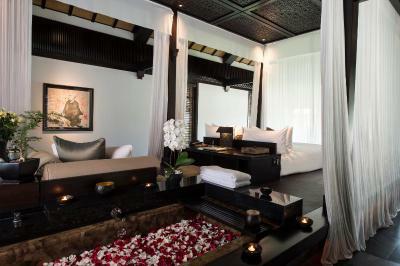 Not to forget the stunning spa ! A must do. 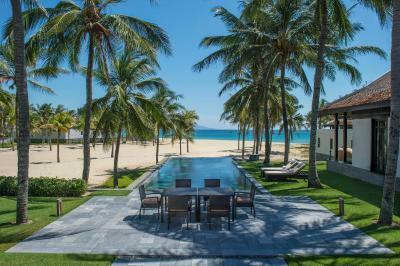 Four Seasons The Nam Hai, Hoi An, Vietnam This rating is a reflection of how the property compares to the industry standard when it comes to price, facilities and services available. It's based on a self-evaluation by the property. Use this rating to help choose your stay! 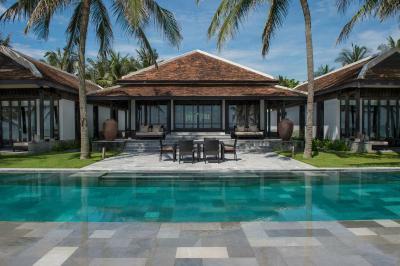 Located on the unspoiled shores of Hoi An Beach, Four Seasons The Nam Hai, Hoi An, Vietnam offers luxurious villas with iPod docks and free WiFi access. 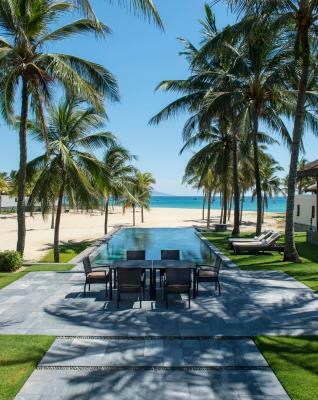 It features 3 beachfront pools and a spa. 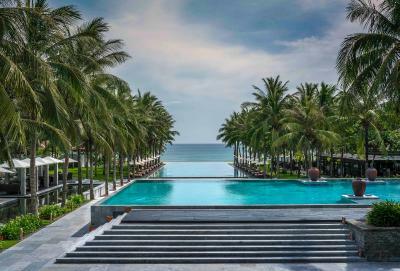 Four Seasons The Nam Hai, Hoi An, Vietnam is a 30-minute drive from Danang International Airport. 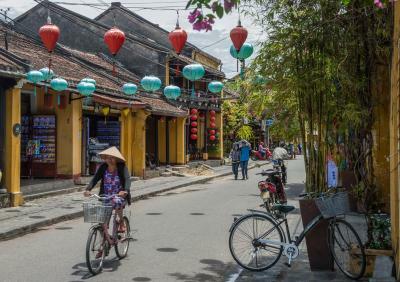 Hoi An Town is a 10-minute drive away. Spacious villas feature walk-in closets. 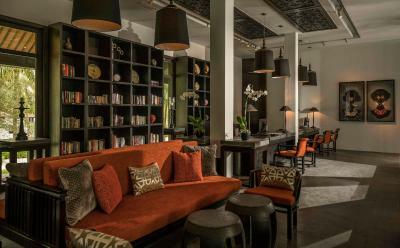 They offer flat-screen cable TV and BOSE sound systems. Bathrooms come with rain shower. Tea/coffee maker and mini-bar are available. 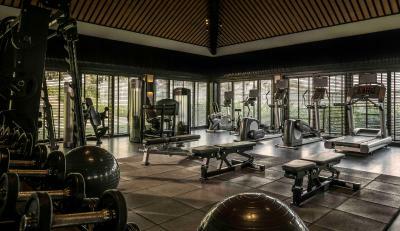 Guests can choose from 4 tennis courts or play a game of badminton or basketball. Guests can enjoy a dip in the child-friendly upper pool or choose to swim in the narrow lap pool or the beach-front Olympic pool - both suitable for adults and strong swimmers only. A library is available for those who wish to read. A variety of activities are available for children at Kids’ Club. 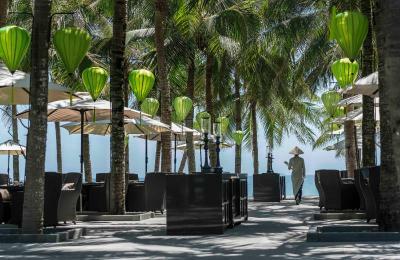 The Restaurant offers guests the chance to dine by the sea while tasting the best of Vietnamese and international cuisine. 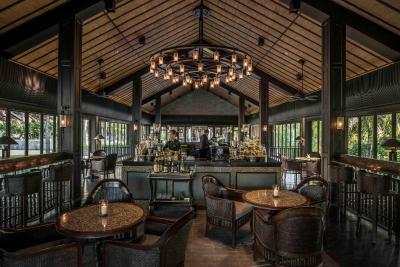 The Bar offers a wide selection of cocktails and snacks. 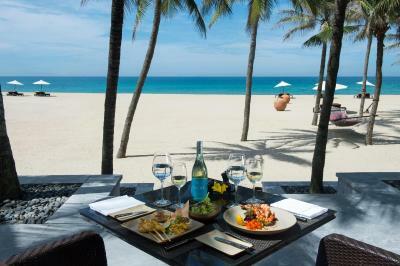 Beach Restaurant serves an assortment of seafood and grills. 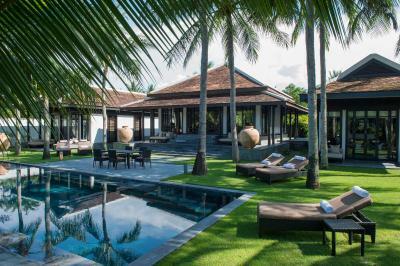 When would you like to stay at Four Seasons The Nam Hai, Hoi An, Vietnam? 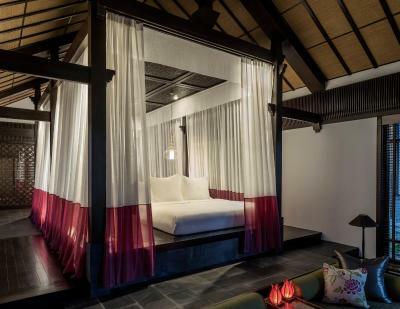 Offering ocean views, this one-bedroom villa has a raised central platform fitted with a bedside bathtub. 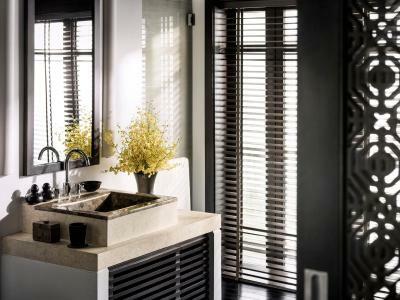 Bathroom at the back opens out to a private garden and comes equipped with an outdoor rain shower. Free toiletries and a hairdryer are included for your convenience. 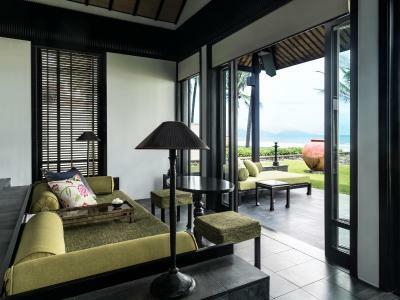 Includes daily buffet breakfast for 2 people at Cafe Nam Hai when staying in this villa. 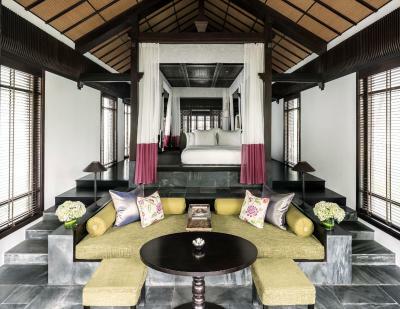 Resting on the shoreline, this beachfront villa consists of one bedroom and a raised central platform fitted with a bedside bathtub. 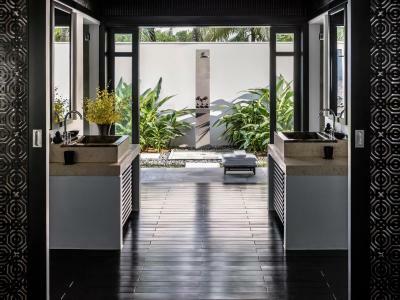 Bathroom at the back opens out to a private garden and comes equipped with an outdoor rain shower. This spacious one-bedroom villa consists of a raised central platform and separate attached children's room fitted with a sofa bed, TV and gaming console, board games and children's amenities. 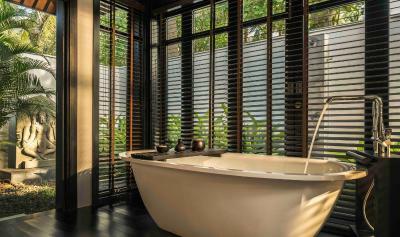 At the back, the main bathroom opens out to a private garden and comes equipped with an outdoor rain shower. 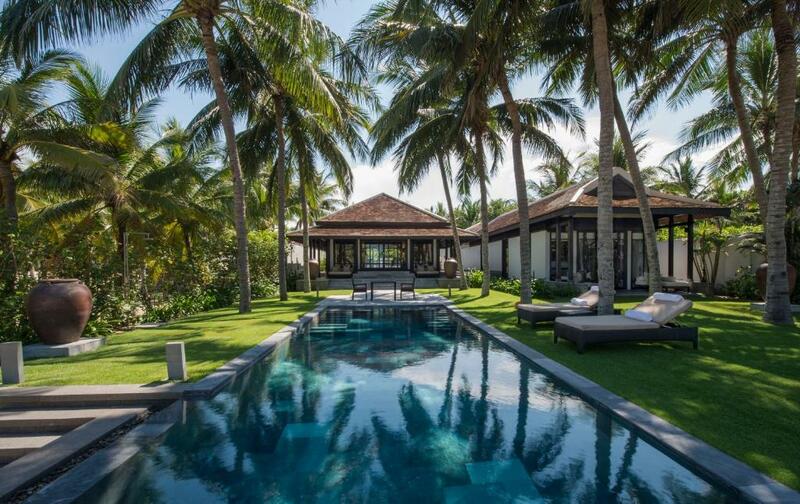 This villa has a private pool, flat-screen TV and kitchen. 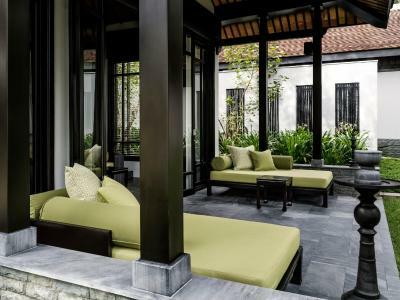 Featuring a heated swimming pool surrounded by tropical gardens, this two-bedroom villa features high Vietnamese-inspired walls and is furnished with a separate living pavilion. A dining area is fitted with dining table and refrigerator. 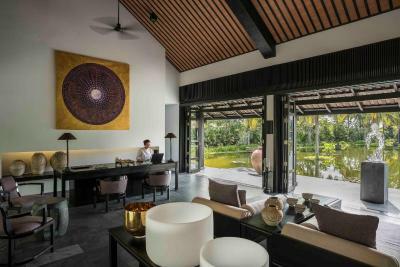 Located in a private hilltop position, this three-bedroom villa is surrounded by lush landscaping and features a heated swimming pool, a lotus pond, and a separate pitched-roof living and dining pavilion. 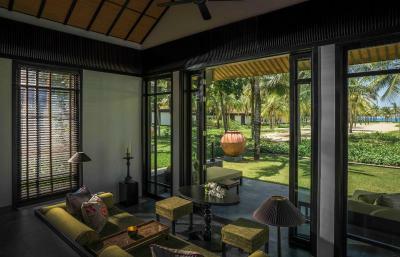 Each bedroom has an private bathroom that opens out to tropical gardens and a private outdoor rain shower. Private butler is available. 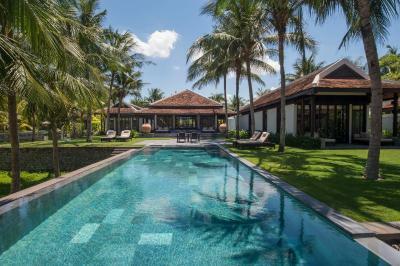 This villa features a dining area, private pool and flat-screen TV. 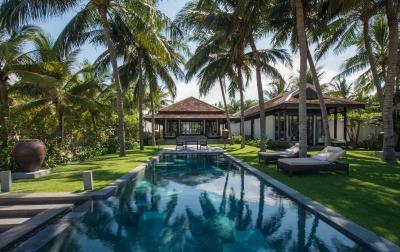 With direct access to the beach, this sumptuous and spacious villa consists of three bedrooms and a private pool. 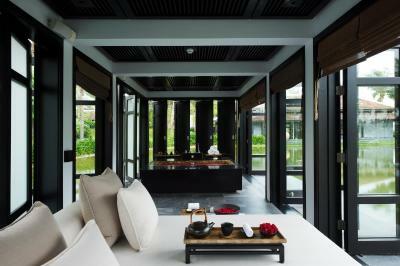 Poolside sundeck and separate living pavilion are also included for guests to gather after a long day. 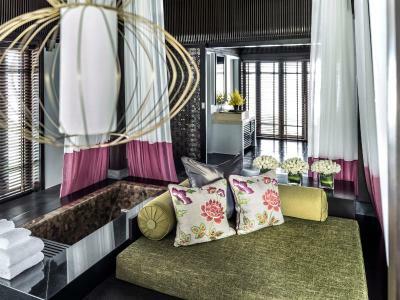 Each bedroom is fitted with a small lounge area and outdoor shower. 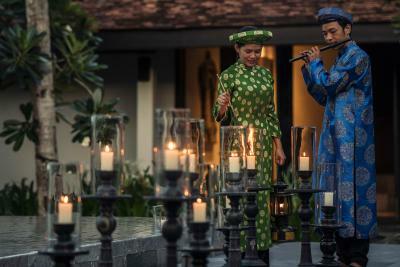 House Rules Four Seasons The Nam Hai, Hoi An, Vietnam takes special requests – add in the next step! 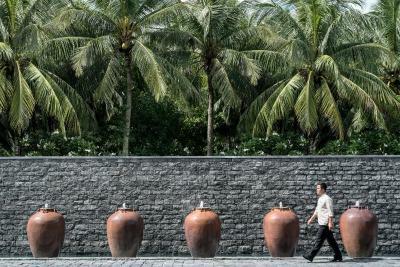 Four Seasons The Nam Hai, Hoi An, Vietnam accepts these cards and reserves the right to temporarily hold an amount prior to arrival. For your children's safety, please note that pool usage has an age restriction. 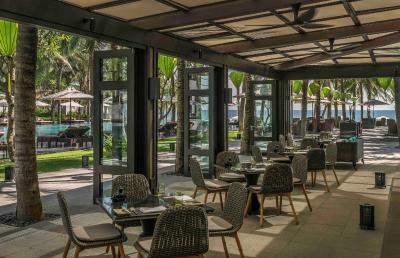 A compulsory charge for Christmas’s Eve Gala Dinner applies to all guests whose stay includes the night of December 24, 2019. 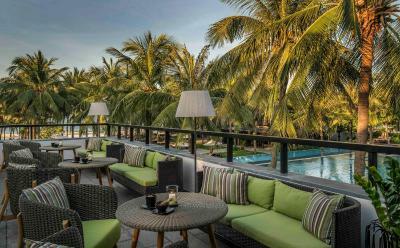 Rates are USD 254 per person aged 13 and over and USD 127 per child aged 5 to 12 (children aged 4 and under dine for free with their families). Dinner rates are inclusive of 15.5% tax and service charge. 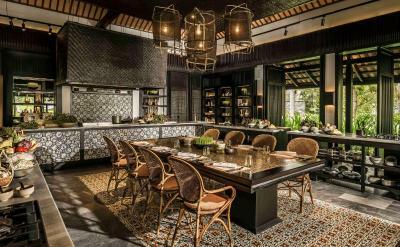 A compulsory charge for New Year's Eve Gala Dinner applies to all guests whose stay includes the night of December 31, 2019. 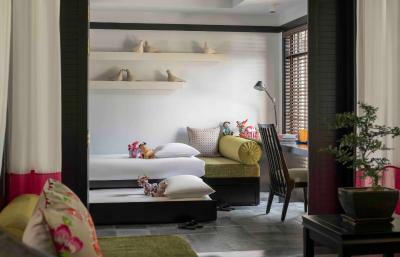 Rates are USD 368 per person aged 13 and over and USD 184 per child aged 5 to 12 (children aged 4 and under dine for free with their families). Dinner rates are inclusive of 15.5% tax and service charge. 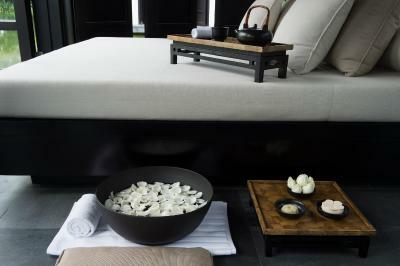 The bed linen ,pillows ,bicycles ,the spa , The food I could go on and on ! Nothing major. Should stop using plastic water bottles; the piped music sometimes disturbing of the tranquility. Beautiful site; wonderful staff; excellent food. The construction quality wasn’t good enough to meet the level of the hotel. You see wear-and-tear due to the weather and humidity. Excellent beach was only kept clean within the hotel boundary, remainder of the beach on both sides was strewn with washed up litter; of course this was not the hotels fault but the hotel could assist the clean up as part of helping the local community. it was the paradise on earth. Breakfast is same every day. Corkroach in the shower room scares me. 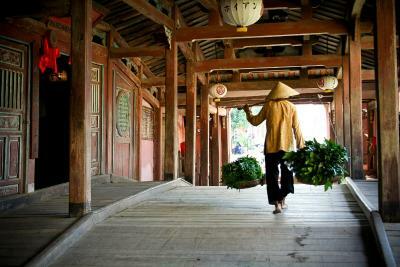 Otherwise, it is perfect place to stay in Hoi An area. The bed was very comfortable and soft but too soft for back support. It is beautiful and very well managed. Kids Club is decently good.